U.S Secretary of State Mike Pompeo holds media briefing at State Department in Washington DC on 01 February 2019 accusing Russia for violation of the Treaty, Pompeo announced that the United States will withdraw in 180 days from the treaty: Photo Chip Somodevilla/Getty Image. The United States is suspending one of the last major nuclear arms control treaties ever made with Russia after heated conversations between the two nuclear armed nations who recently failed to resolve a long-running accusation that Moscow is violating the Reagan-era treaty. Secretary of State Mike Pompeo announced the decision on Friday as the Trump administration maintained that the Russian government has been unwilling to admit that a missile it has deployed near European borders violates the terms of the 1987 Intermediate-Range Nuclear Forces Treaty. Mr. Pompeo and his deputies have insisted that Moscow destroy the missile. Mike Pompeo added that the United States will withdraw in 180 days from the treaty, which has been a centerpiece of nuclear arms control since the Cold War. Both United States and Russia are accusing each other for violating the treaty’s terms. “Russia has jeopardized the United States’ security interests,” Mr. Pompeo said, “and we can no longer be restricted by the treaty while Russia shamelessly violates it.” But while the United States has insisted Russia’s actions sank the treaty, the Trump administration’s real aim is to broaden its prohibitions to include China. 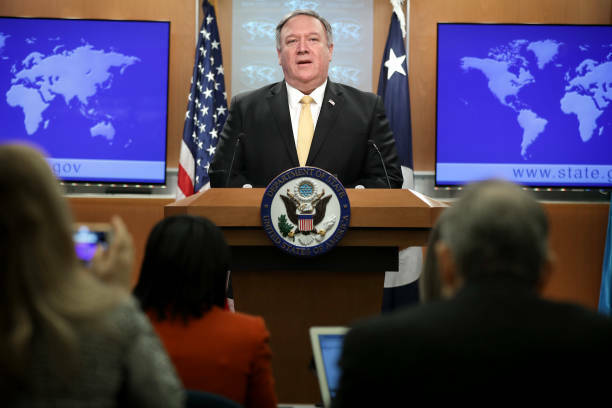 “Countries must be held accountable when they break the rules,” Mr. Pompeo told journalists at the State Department. 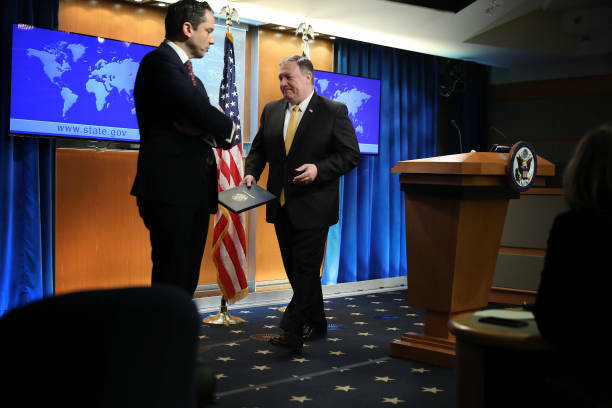 U.S. Secretary of State Mike Pompeo walks away from the standing lectern podium after conclusion of a news briefing at the State Department, Washington DC on 01 February, 2019. Constrained by the treaty’s provisions, the United States has been prevented from deploying new weapons to counter China’s efforts to cement a dominant position in the Western Pacific and keep American aircraft carriers at bay. China was still a small and unsophisticated military power in the mid-1980s, and not a signatory to the treaty that was negotiated between the United States and a rapidly weakening Soviet Union. With the treaty on its last legs, the question is whether Mr. Pompeo’s announcement will result in a flurry of last-minute negotiations with Moscow — which seems unlikely — or whether it will accelerate the Cold War-like behavior among the United States, Russia and China. Complicating that question is the American intelligence agencies’ warning this week that Russia and China are “more aligned than at any point since the mid-1950s.” The fate of the treaty has quickly become a test of the continuing struggle inside the Trump administration, and with its allies, over how to handle an increasingly aggressive Russia. 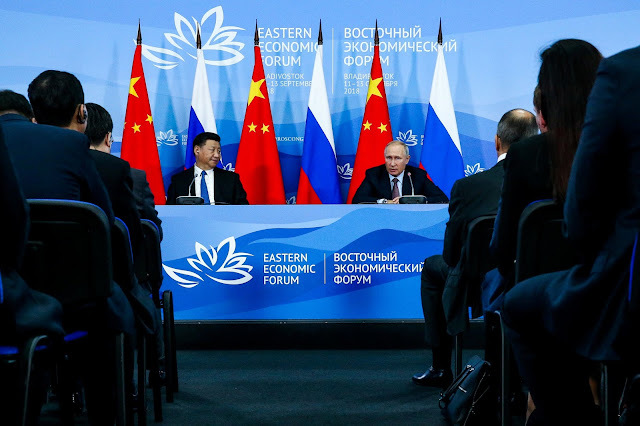 Chinese President Xi Jinping and President Vladimir Putin met in September 2018 to discuss a mutual understanding on geopolitics in Vladivostok, Russia. Photo by Alexander Ryumin. But Mr. Trump has surrounded himself in the White House with hawkish advisers, including John R. Bolton, the national security adviser, who has been a major critic of treaties that he believes impinge the United States’ ability to counter new or rising foreign threats. The decision to leave the nuclear arms treaty took American allies by surprise when word of the decision first leaked out in October and was quickly confirmed by Mr.Trump's administration. The North Atlantic Treaty Organization (NATO), the military alliance that was created to counter the Soviet Union Warsaw Pact and communism threat to capitalism over 70 years ago, strongly blamed the Kremlin in every stance that seek to oppose or compete against the western hegemony. The alliance is supporting United States withdrawal for the Treaty: The announcement to abandon the arms control regulations came just ahead of the expiration, on Saturday, of a 60-day deadline. Mr. Pompeo’s formal announcement begins a six-month clock that Trump administration officials believe will end with a full American withdrawal from the treaty, the United States would be free to begin with testing or deploying its own weapons. United States is preparing to modify existing weapons, including its non-nuclear Tomahawk missiles, and is likely to deploy them in Guam, where the military maintains a large base and they would face little political opposition. The aim of the treaty was contain all category of weapons — land-based missiles with a range of 300 to 3,400 miles — that both the United States and the Soviet Union had deployed in the 1980s, and still posing danger to global security. Mr. Pompeo acknowledged a risk of a new arms race if the treaty is ultimately scrapped after the six-month window. “We hope they’ll come back into compliance,” he said. He added: “There’s no mistaking that the Russians have chosen to not comply with this treaty and present the risk of continued arms growth in a way that they had committed to, back when they signed this treaty, that they would not do.” For many years, the I.N.F. was considered a model arms control treaty. It allowed for on-site inspections and extensive exchanges of information — exactly what the Trump administration now seeks from North Korea and other states. In 2014, the Obama administration also accused Russia of developing a missile that violated the treaty. Dan Coats, the national intelligence director, published a detailed history of the Russian violations. Experts cited Russian unhappiness with the treaty, going back at least 10 years, before Moscow focused on new generations of missiles that would extend its reach without costing it much money. Russian officials have charged that American missile defense interceptors in Eastern Europe could be easily refashioned into offensive weapons, and that the rise of armed drones, which had not been invented when the treaty was signed. U.S said Russia had aggressively used social media accounts to portray the United States as the treaty-breaker and the aggressor. That argument has won some sympathy in Europe, where many critics portray the treaty’s demise as an example of the Trump administration putting its own agenda before Europe’s. The Pentagon has already been developing nuclear weapons to match, and counter, what the Chinese military believed to possessing. Some experts stated that the main objective behind U.S withdrawal from the arms control is to contest against China not necessary Russia's threat, although they all adversaries that US agenda seek to countering.